Located in the heart of Vienna, the location Haus am Meeres is famous for its zoo. After renovation, the location offers now on its top-floor a high class venue for business events. This venue is ideally situated next to the rail station Neubaugasse and the Wipark parking garage. 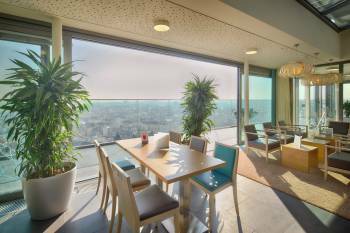 This new space provides an amazing view on Vienna’s roofs, thanks to a large rooftop terrace. The location on the top floor is 170 m² and can receive up to 110 guests. Haus am Meeres is well suited to parties or receptions. But also for Business Events, as you can add in your booking a 150 m² presentation room situated in the 10th floor.